Annie works with GDCI’s new Streets for Kids program, creating a supplement to the Global Street Design Guide. She has worked towards social and environmental justice in cities, most recently in Thailand at the intersection of landscape architecture and climate resilience. Previously, she co-managed a construction site in northern Rwanda with MASS Design Group, and worked with architecture firms in New York and San Francisco. She has been a Henry Luce Scholar and Global Health Corps Fellow. 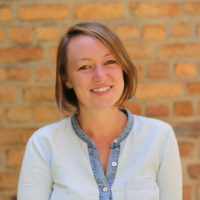 Annie holds a Master and Bachelor of Architecture from Tulane University, graduating with the architecture school’s Outstanding Thesis Award and Alpha Rho Chi Medal, and studied at the Danish Institute for Study Abroad in Copenhagen. Annie is an enthusiastic cyclist as both a local commuter and long-distance tourer.